While it is well known that many hormonal imbalances can affect a woman's moods and make them irritable, in some cases the problem is more severe and constitutes depression. Depression is a very common mental health problem for women, but that doesn't make it any less serious. In addition of causing many monetary losses from missed days at work and low productivity, untreated depression can become chronic and cause a great degree of social isolation and even suicide. Please keep reading in order to understand why depression happens, how to recognize it, and how to manage and treat it. It is estimated that 16.5% of the US population experiences a depressive episode at least once throughout their lifetimes. At least 2% of the U.S. population will experience an episode classified as severe during the next 12 months. 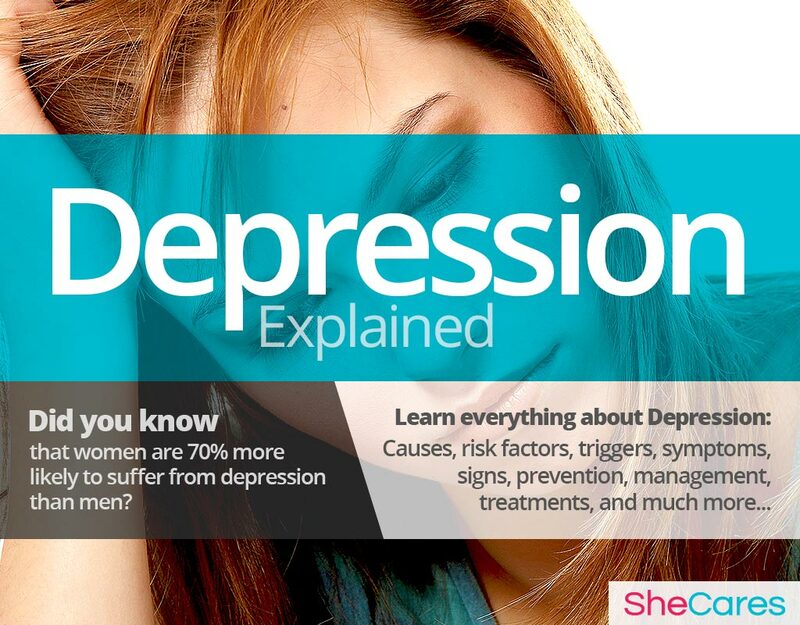 Women are 70% more likely to suffer from depression than men. Depression is a serious mental illness, characterized by a persistent state of low moods, feelings of worthlessness and lack of energy lasting for at least a month. While many people confuse depression with the momentary feeling of sadness, it is important to understand that they are different things. It is perfectly normal -and even expected- for any person to feel sadness or despair at some point. On the other hand, depression doesn't go away on its own, it interferes severely with a person's quality of life and has very serious complications. Although full-blown depression is a complex disorder that encompasses physical, social, and psychological factors, many researchers believe hormonal imbalance is a major player in the development of depression among women, or in the pervasiveness or the temporary exacerbation of its symptoms. This is particularly noticeable during certain stages of reproductive life where rapid hormonal fluctuations are common, like puberty, pregnancy, post-partum - including breastfeeding - and menopause. In the case of women who suffer from chronic or recurrent depression, PMS can also be linked with a significant worsening of the symptoms. Depression can present itself in many different ways or even as a part of different disorders. Most commonly, depression appears as major depressive disorder, dysthymia, or seasonal affective disorder, but there are other subtypes of depression. As seemingly different as these disorders can be, the mechanism behind their appearance tends to be the same. In order to understand the common processed behind the different types of depression, continue on to the next section to learn more about their hormonal and non-hormonal causes. What sets bipolar disorder mood swings apart from those experienced by all women throughout their lives is their intensity and the extent in which they affect their everyday functioning. Although no two bipolar disorders are alike, they can be effectively treated with medications and therapy. Hip fracture is more common in depressed elderly people. That is why being elderly and depressed and lonely significantly increases the chances that you will break bones if you fall over. Learning about the causes of depression provides the key to understanding how to prevent and treat this troublesome disorder. While the exact causes of depression are complex and not completely understood, most doctors and researchers believe hormonal changes are the primary cause of depression, especially among women. In addition to these completely normal hormonal causes, other factors and medical conditions can, in more rare instances, cause mood swings. Continue reading to learn more about both the hormonal and additional causes of mood swings. Hormones are chemical messengers that control every organ in the body, so when changes in these hormone levels occur, certain health disorders can arise. Medical researchers have found that hormonal fluctuations, especially of estrogen levels, make women more susceptible to depression, apathy, and generalized low moods. This is because estrogen and progesterone influence the production of serotonin, a neurotransmitter also known as one of the “feel-good” chemicals because of its mood enhancing qualities, as well as its influence on energy levels, libido, and appetite. 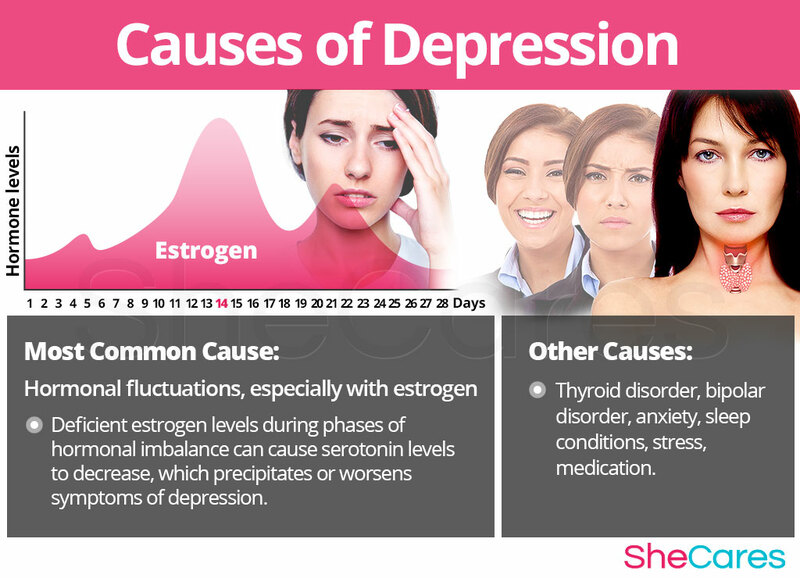 Estrogen levels fluctuate and are more likely to become deficient at certain points of a woman's menstrual cycle and during phases of significant hormonal imbalance - puberty, pregnancy, post-partum, and menopause - which results in serotonin levels to decrease and a precipitation or a worsening of symptoms of depression. 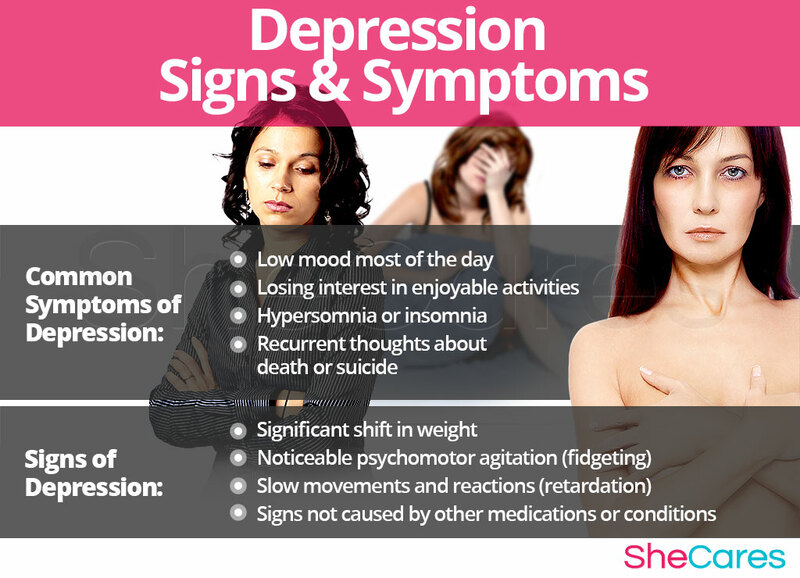 In this sense, we can say depression in women is strongly affected by the hormonal fluctuations during the changes women go through during their reproductive life. Furthermore, there are also specific hormonal causes and typical environmental factors which can explain the appearance and severity of depression according to the stage of a women's reproductive life in which this disorder presents itself, such as around PMS and during puberty, pregnancy, post-partum, and menopause. PMS is a consequence of hormonal fluctuations linked to the menstrual cycle. It is a collection of disorders, which may include mood swings, sudden bouts of weepiness, among others. Puberty is the stage in which a girl's body begins to produce reproductive hormones; these and other factors, such as academic pressures and body image issues, contribute to the development of depression during puberty. Pregnancy leads to extreme changes in the production of reproductive hormones, which along with other factors, like having experienced difficulties with conception or previous miscarriages can trigger the onset of depression or worsen a pre-existing one. Postpartum and breastfeeding is another stage where reproductive hormones are imbalanced, leading to symptoms like baby blues. However, other factors can contribute to developing more serious mental health disorders, like postpartum depression. Menopause is the stage in a woman's life when production of reproductive hormones naturally declines, signaling the end of a woman's fertility. As well as hormonal causes, other factors add to the reasons for depression during menopause, including the experience of other symptoms of menopause. While hormonal imbalance is the major underlying cause of depression during a woman's life, experts also point out that mood disturbances may be caused by other less common underlying conditions including thyroid conditions, sleep conditions, and as a part of bipolar disorder. 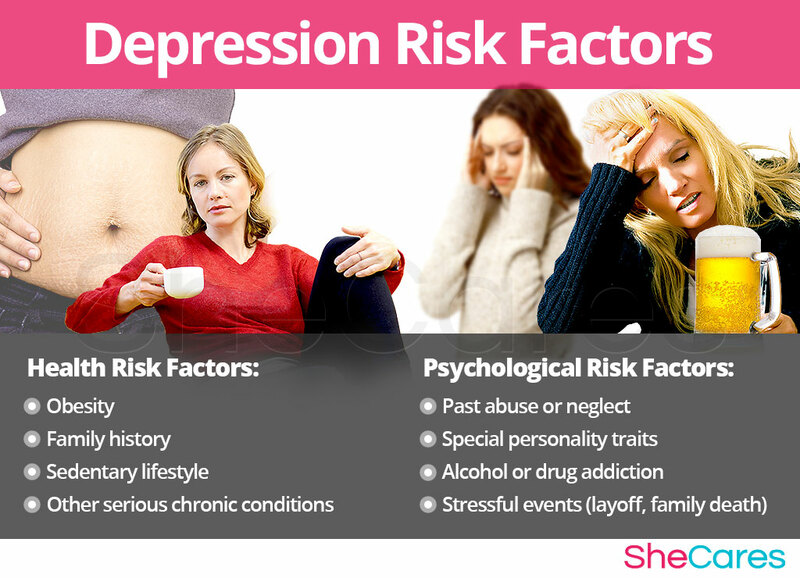 Keep reading to learn what these risk factors are that have such a profound effect on a woman's experience of depression. Some women are more likely than others to suffer from depression because of inherent psychological, behavioral, and health reasons - such as family history, personality traits, or past emotional trauma. These predisposing factors can affect a woman's hormone levels and increase the chances of developing depression during her reproductive life. Continue reading to discover the symptoms and signs of depression to be able to choose a treatment specific to its cause. Depression is not always easy to spot, because various events throughout our lives occasionally make us feel sad, apathetic, and miserable, while certain diseases can affect our energy levels, concentration, or appetite. However, if these symptoms become persistent, long-term, and impair our life, they might indicate a depression. Clinical depression can happen to all women, despite their age, background, or health status. Persistent sadness, fatigue, and other symptoms often interfere with women's life. Though the causes of clinical depression are not fully known, it can be effectively treated with medication and psychotherapy, as well as some alternative therapies. Because every woman has her own way of managing her emotions and stress, her ways of coping with or expressing depression are also different. However, in order to be classified as clinical depression, certain symptoms must be present for at least two consecutive weeks. A low mood during most of the day, especially during mornings, either self-reported or noticed by others. Losing interest in activities or hobbies that used to be very enjoyable. Lack of appetite or excessive hunger and binges. Excessive sleep (hypersomnia) or insomnia. Feeling permanently fatigued or excessively tired even right after waking up. Feeling worthless, excessively guilty about things you have no control over, or like being a burden to others. Recurrent thoughts about death or about committing suicide. Lack of ability to concentrate. In addition to these more noticeable symptoms, which may be noticed by the woman herself or by the people around her, medical signs are criteria that require a physician's assessment. The following medical signs will most likely be taken into account by a doctor when diagnosing depression. Significant shift in weight (losing or gaining 5% of the body's total weight). Noticeable psychomotor agitation (fidgeting) or retardation (slow movements and reactions). All other signs and symptoms are not caused by other medications or conditions (such as hypothyroidism). Before attempting to treat depression, it is advisable that women seek medical attention so that they can receive the proper diagnosis. To diagnose and identify the symptoms of depression, a doctor must typically perform four procedures. First, he or she should review the patient's medical history, then conduct a physical exam, and finally do a psychological evaluation. The doctor may also order additional tests, if necessary. In rare cases, when depression is left untreated, it can lead to certain complications, which are riskier for a woman's emotional and mental health. These possible, but uncommon, complications of depression can include anxiety disorders, deterioration of personal relationships, suicide, and other mental health problems, and they have some specific warning signs. Women with a personal or family history of depression, or other pre-existing risk factors, may be concerned about developing symptoms of depression later on. Read the next section to learn more on how to prevent depression or make it more manageable. Every woman copes with her depression differently. Several self-help approaches, such as volunteering, regulating sleep, or acupuncture can help you keep your mind distracted from the negative thoughts and enable you to become mentally stronger and more confident. They can also prevent future bouts of depression. While there is no single way to completely prevent depression, there are a few steps that a woman can take to lessen her chances of developing them, or to minimize the impact or length of time in which symptoms occur. In this sense, lifestyle changes for prevention are extremely important, especially with regard to diet, exercise and healthy habits. Moreover, women may seek ways to complement these lifestyle approaches with the use of supplements that help enhance the endocrine system and, therefore, help to prevent or ease symptoms of hormonal imbalance such as depression. For women who are already going through the disorder, prevention may not be possible if depression has already appeared. Fortunately, there are many ways to manage it in order to prevent these “flare-ups” or to lessen the intensity of its symptoms. Keep reading to learn about the different ways to manage depression. When a woman is experiencing depression, she should keep in mind that there are effective ways to instantly manage mood. Making minor daily changes and avoiding triggers can make a huge difference for women who are trying to manage depression. There are certain tips and tricks available that can help improve the experience of depression, giving women the tools they need to cope with persistent low moods. Alternative treatments are also a great way to manage depression. 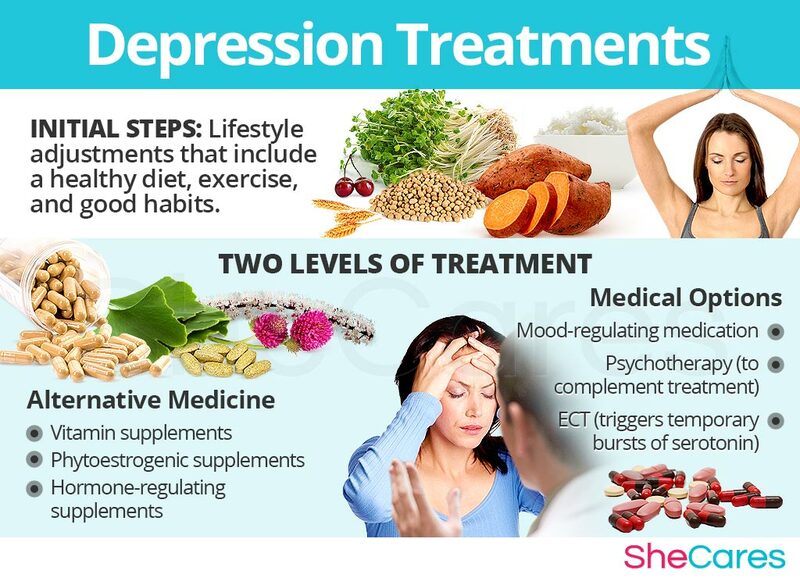 These treatments will not tackle the hormonal cause behind most women's symptoms of depression, but they are effective in reducing stress in the short and medium term. Alternative treatments include acupuncture, meditation and biofeedback. While these measures often help to reduce the frequency and intensity of depression, they are unable to treat the root of the problem, which in most cases is hormonal imbalance. However, there are several natural treatments that can treat the hormonal causes of depression. Please continue to the next section to learn more about treating depression. Depression makes many women feel as if there was no escape from their own mind and sadness. When depressive thoughts and feelings cloud their vision, it is often beneficial to seek help in psychotherapy, for example, a cognitive-behavioral therapy, to manage depression and prevent it from coming back. Depression can be a chronic and debilitating condition, causing a person suffering from it to lose interest in all sorts of social activities and to become increasingly fatigued. While it is becoming an increasingly common disorder among women in many countries, it is more that possible to find an effective treatment for depression. Three levels of approaches can be considered for treating depression. These are categorized as: (1) Lifestyle Changes, (2) Alternative Medicine, and (3) Pharmaceutical Options. When a woman is suffering from a severe depression and there's risk of self harm, it is better to try to be as aggressive as possible from the beginning. 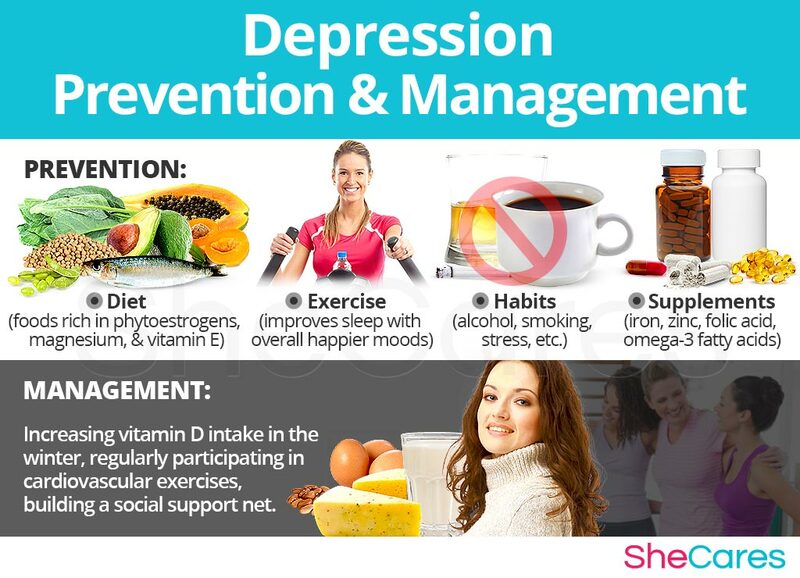 However, many experts recommend that women with mild or short-term cases of depression begin with the least risky approach to mood swings treatment, lifestyle adjustments, and then proceed to the next level of care. Furthermore, women with severe and recurrent episodes of depression should always try to incorporate lifestyle changes and alternative therapies to their medical treatment in order to achieve a long term improvement. The primary level of treatment for depression involves the least amount of risk, though conversely it requires the highest amount of self discipline. Many times some simple changes in lifestyle can reap huge benefits in fighting symptoms of hormonal imbalance and achieving a higher overall level of health. It is important to remember that, while mild or moderate but short-term cases of depression can be treated altogether with lifestyle changes; severe or chronic episodes will require medical attention, although any medical treatment can also be helped a lot if combined with any of these techniques. Fundamentally, an improved diet, regular exercise, and healthy habits can do a woman great service. While these changes can help a woman manage the symptom, they are unable to get to the root cause of it, which is most commonly hormonal imbalance, and further treatment may be necessary. Alternative medicine has proven to be an excellent way of treating mild cases of depression related to hormonal imbalance, and an excellent complement to medication for women with severe or recurrent depression. Alternative medicines and supplements involve little to no risk and can be an extremely effective way to treat mild cases of depression. In the case of herbal supplements, there are two main types that can be used: phytoestrogenic and hormone-regulating herbal supplements. These supplements, such as black cohosh, contain estrogenic components produced by plants that complement the low estrogen hormones in a woman's body, helping improve symptoms of depression. By introducing plant-based estrogens into the body, these herbs treat the underlying estrogen deficiency behind depression. These supplements, including Macafem, stimulate the body's natural hormone production by nourishing the pituitary and endocrine glands, helping the whole hormonal system produce hormones more efficiently. This ultimately results in balancing not only estrogen but other important hormones such as progesterone. These supplements can be considered the safest and most natural way to treat the underlying hormonal imbalance behind depression, and can be taken throughout a woman's life, as they support the body's natural hormone production. Additionally, there are some other types of supplements that can also alleviate depression, or at least make it more manageable, including vitamins and other herbal supplements. A combination of approaches is usually the most effective route to take, Lifestyle changes combined with alternative medicine will most likely be the best way to alleviate mild to moderate episodes of depression. However, for women with severe cases - especially if any degree of suicidal ideation is present - a more drastic treatment is necessary. Interventions at the third level involve the highest risk and often the highest costs. Not all treatments are suitable for women at every life stage, so it is strongly recommended to speak to a licensed healthcare practitioner before starting any pharmaceutical treatments for depression. There are two main types of medical options that can be prescribed to treat depression, and most often they will be combined: antidepressants or mood-regulating medication and psychotherapy. These three approaches are not mutually exclusive. A woman may use different approaches at different times or any combination of them, depending on the duration and severity of symptoms. Today more and more women find that dealing with menopause symptoms is best accomplished via a combination of healthy lifestyle and alternative treatments. American Psychiatric Association. (2000). Diagnostic Criteria for Major Depressive Disorder. Diagnostic and Statistic Manual IV Edition, Revised. APPI.